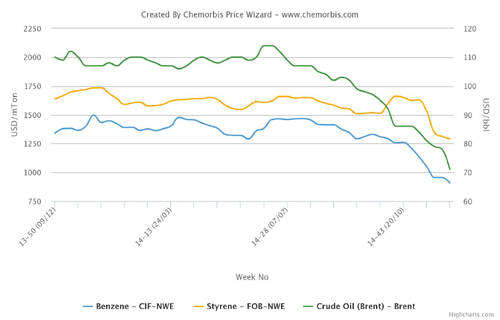 Spot styrene prices in Asia were on a firming path over the week driven by ongoing shutdowns, according to ChemOrbis. Although energy prices are on a volatile path, the offline capacities for styrene and PS encouraged sellers to lift their PS offers, supported by expectations of improved demand ahead of the Ramadan holidays. A Southeast Asian PS producer increased their offers by $40/ton for GPPS and $30/ton for HIPS. “Spot styrene prices surged mainly due to short availability for this monomer. Plus, the explosion at an aromatics plant in China generated a firmer view, we believe, although it is not related to PS directly,” a producer source highlighted. “For now, we are not under sales pressure since we don’t have much material but customers continue to push for discounts,” he added. A converter in Malaysia commented that both South Korean and local materials are very expensive which caused them to source Singaporean PS. However, the buyer is concerned about a scheduled shutdown in April which could disrupt supply for this origin. “Demand may start to pick up in the near term due to Hari Raya in Indonesia. It will be the peak season for both Indonesian and Malaysian markets since they need to procure PS to manufacture food packages. We are optimistic that both prices and demand will pick up soon,” a trader in Indonesia stated. Singapore’s TPSC will conduct a three-week shutdown at its 95,000 tons/year PS plant while the Philippines’ DFE Chemical was planning to shut its 30,000 tons/year plant at the end of March. South Korea’s Samsung Total Petrochemicals may shut its 280,000 tons/year No. 1 styrene unit at Daesan soon, according to market sources. Following the 45-day maintenance, the plant’s capacity will be raised to 400,000 tons/year. Plus, the company will shut its No.2 unit with 650,000 tons/year capacity at Daesan next week for a month or longer. SK Global Chemical has kept its 350,000 tons/year styrene unit in Ulsan shut since August 2014 due to poor margins. Taiwan Styrene Monomer shut its 160,000 tons/year styrene plant in September last year on technical issues and delayed the restart until Q2 2015. LG Chem’s 180,000 tons/year styrene capacity in Daesan has been offline since mid March for a turnaround. The company will undergo maintenance at its 500,000 tons/year Yeosu plant in April as well. Lotte Chemical shut its 580,000 tons/year styrene plant on March 20 for maintenance. 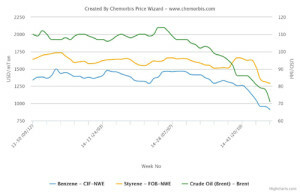 According to ChemOrbis, spot styrene prices soared $75/ton week over week while benzene costs gained $25/ton in the period, both on a FOB South Korea basis.